A master historian explores how war has shaped our societies—and how societies shape warfare—from Ancient Greece to the present day, in a sweeping survey that offers profound lessons for facing today’s conflicts. Long acclaimed as one of our leading scholars of ancient history, Victor Davis Hanson also has become a wise counselor on current affairs, bringing a historian’s deep knowledge of past conflicts to bear on the crises of the present, from 9/11 to Afghanistan. “War,” he writes, “is an entirely human enterprise.” Ideologies change, technologies develop, new strategies are invented—but human nature is constant across time and space. The dynamics of warfare in the present age still remain comprehensible to us through careful study of the past. Though many have called the War on Terror unprecedented, its contours would have been quite familiar to Themistocles of Athens or William Tecumseh Sherman. As we face the menace of a bin Laden or a Kim Jong-Il, we can prepare ourselves with knowledge of how such challenges have been met before. 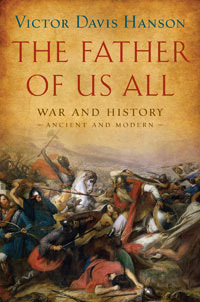 The Father of Us All brings together much of Hanson’s finest recent writing on war and society, both ancient and modern. The author has gathered a range of essays, and combined and revised them into a new work that explores such topics as how technology shapes warfare, what constitutes the “American way of war,” and why even those who abhor war need to study military history. “War is the father and king of us all,” Heraclitus wrote in ancient Greece—as Victor Davis Hanson shows, it is no less so today.